Alternative 170 from Almo Nature is a complete food for adult dogs. One bag of Alternative 170 contains 75% meat, which is also suitable for human consumption. Chicken is the only protein source, making this food ideal for dogs with a food allergy or intolerance. Chicken is high in proteins and low in carbohydrates. In addition, chicken contains fewer calories than beef or pork. This lean meat is the main ingredient in Alternative 170 from Almo Nature. This food for adult dogs contains no offal, only chicken meat that has been approved for human consumption. Because Alternative 170 contains a single protein source and a single cereal type (rice), the food is suitable for dogs with a food intolerance or allergy. Why is Almo Nature Alternative 170 more expensive? No offal is used in the production of Alternative 170 from Almo Nature. This dog food contains 75% fresh chicken with the so-called HFC label. This means that the meat in Alternative 170 is approved for human consumption. This pure and fresh quality meat does not contain any genetically modified organisms (GMO) and is therefore suitable for dogs with a hypersensitive reaction to food. In addition, 100 grams of dry food contains at least 170 grams of meat. 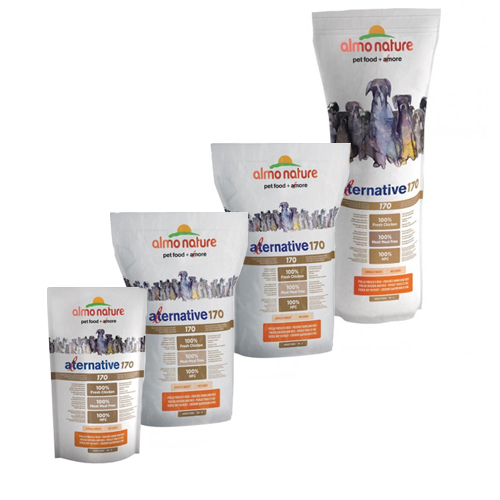 Almo Nature Alternative 170 is available in a pack of 750 grams, 3.75kg or 9.5kg. Fresh chicken 75%, rice 17%, beet pulp, alfalfa, minerals, Vitamins, yeast, mannan-oligosaccharides (MOS), fructooligosaccharides (FOS), Vitamin, Vitamin D3, Vitamin E, E1 (iron), 3b201 (Iodine), E4 (copper), E5 (manganese), E6 (zinc), 3b8.10 (selenium), L-carnitine, DL-Methionine, calcium 0.94% phosphorus 0.6%, Omega 3 0.68%, Omega 6 3.56% and moisture 8.5%. Have you used Almo Nature - Dog - HFC 170 Alternative before? Let us know what you think about this product.